The sport has come a long way since the first event held at Silverstone, an English circuit in the historic English county of Northamptonshire just as famous at the time for cobblers as racing drivers. It was 1950 and the F1 event attracted 33 drivers and 15 constructors for the launch of the drivers’ world championship with the British Grand Prix. The second-oldest constructor and the second most successful in terms of race wins, McLaren, has fallen on hard times in recent years but have shown signs of real progress this season. This is partly indebted to the abilities of rookie Lando Norris, who secured a fine sixth place and thus eight points under the lights in Bahrain. It may not sound like much for a team so decorated; a team who feel they should be challenging for victories. 2018 had promised much – with 40 points in the first five rounds – but it turned out to be a false dawn with a paltry 22 in the next 16. Much of that was down to Fernando Alonso extracting the absolute maximum from a car that was at the back of the midfield on raw pace. So far this season there is clear evidence of a jump in performance. On raw pace alone they ranked fifth of the 10 teams in both the season opener in Australia and the second race in Bahrain. Over the course of last season they only managed this twice in 21 races and were ninth over the entire season by the same metric. Norris qualified an excellent eighth in Melbourne, but their showing in Bahrain was even more impressive. Teammate Carlos Sainz was mere milliseconds (in fact just 0.062 seconds) away from the quickest Red Bull of Max Verstappen. Norris again made it into Q3, too, two-tenths behind his team-mate. The young Briton’s run to sixth in the kingdom confirmed that McLaren had the race pace to match their raw pace. Red Bull had a few issues and certainly were not pulling up any palm trees in the desert. However, the fact that McLaren could genuinely challenge them in qualifying and the race is significant. Norris’s eventual sixth place came with a fightback and one that showed a talent beyond his years. Down five places to 14th by the end of the first lap, by lap 10 he was up into the points by moving past Sergio Perez and by lap 16 into ninth behind Nico Hulkenberg’s Renault. With Hulkenberg’s retirement two laps from the end and subsequent safety car until the chequered flag, it ensured a fantastic result for the teenager in only his second grand prix. More important than the result and their first points of the season, though, is the pace they showed in doing so. To make sure this jump becomes a leap they cannot fall behind following in-season development as they did last year. It is not something that Norris expects. “We’ve tried to make the car a bit more simple this year,” he said during an interview with GulfWeekly at a special McLaren Bahrain customer grand prix parade organised in partnership with Mumtalakat, for owners to showcase their vehicles. “It was getting complicated and there were so many things leading onto different bits, which wasn’t confusing ... but it was just becoming complicated. As reported last week, McLaren Automotive CEO Mike Flewitt welcomed guests at the Mumtalakat offices and Norris led the 12-car parade which began at the Four Seasons Hotel Bahrain Bay, stopping at the Arcapita Building and continuing to the Bahrain International Circuit and Gravity Village in Sakhir. 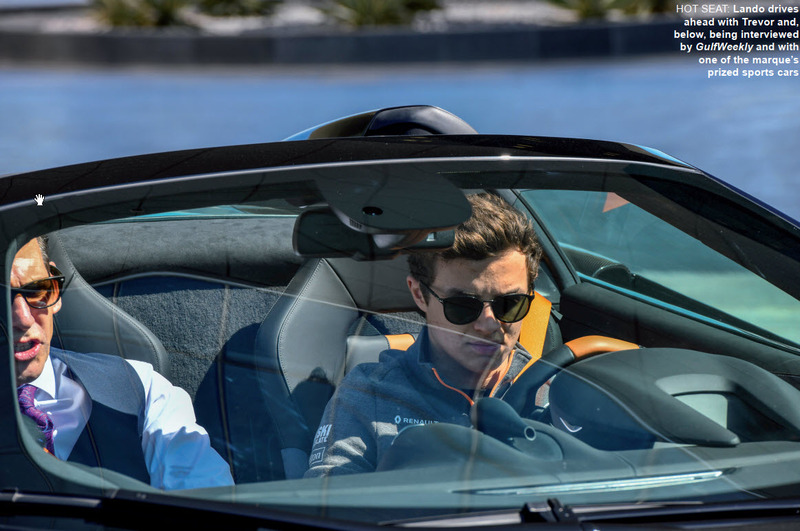 Trevor Fletcher, head of McLaren Bahrain, said the event was part of the company’s aim to give customers ‘the best supercar experiences’ and Lando impressed everyone he met with his charm, good humour and racing knowledge. If Norris can once again similarly impress on the track this coming weekend in China with the world’s eye trained on the sport, there’s no reason why he can’t be allowed to be optimistic. Motor sports fans across the kingdom will be cheering him on all the way to the finishing line.